This looks like an Emerson, Lake & Palmer album cover. All three of them look like deer caught in the headlights. Well, thank goodness Sophianism was officially repudiated. They're also making the Spirit proceed from both "Son and Father" - but who are up in the right and left corners? The whole thing looks like a mess. The one on the right kind of looks like a rip-off of William Blake's Newton. Which is odd if true because for Blake, Newton was pretty much the devil. Maybe that should be Young Penitent's next album cover. It's done according to the vision of st. Bernard of Clairvaux (born shortly after the Great Schism). I see a difference with Orthodox icon of the Bridegroom, I mean that at first I 've seen this, I thought something is wrong. Then I read about strange (and not encouraging to do ascetic practices etc.) RC devotions that appears after the "visions" (if somebody every day says 3 "Our Father" and 3 "Hail Mary" to honour this wound on the shoulder made by the cross, they will not die in an accident and their venial sins will be forgiven). As well as the problems Dominika raised, those eyes are just creepy. I was told to 'check out' this forum. Now, should all who post here be banned? This place looks like hell and should not be allowed to anyone considering.........well, just about anything! Stunned, am I and shamed, or is it shammed! Saw something today which seemed to be like Our Lady reading a book. Maybe Our Lady is the patroness of egalitarianism. I think this was done by a former poster here as a project with her children (or something like that). I could be wrong. LBK would know. It's not hard to find icons to buy that look much like that one. Mary being found reading by the angel is a medieval motif in paintings of the Annunciation. Was it the Kaluga icon? This is the Kaluga icon, for reference. Apparently yes. Never seen that kind of icon before. Not sure if schlock but I thought Saints are supposed to look at you or Christ in icons instead of just doing something seemingly random errands. I think the issue was all of the glittery moving stuff in the background. This is similar but I am not sure if it is the same. I was talking about glittery as well. Obviously it's not moving on real icons but the level of bling is pretty similar. Eh, that also is pretty schocky. Icons just don't need any embellishing beyond gold-leaf. It looks unfinished. It would be best if it stayed that way. Overdone, yes, but not schlock. 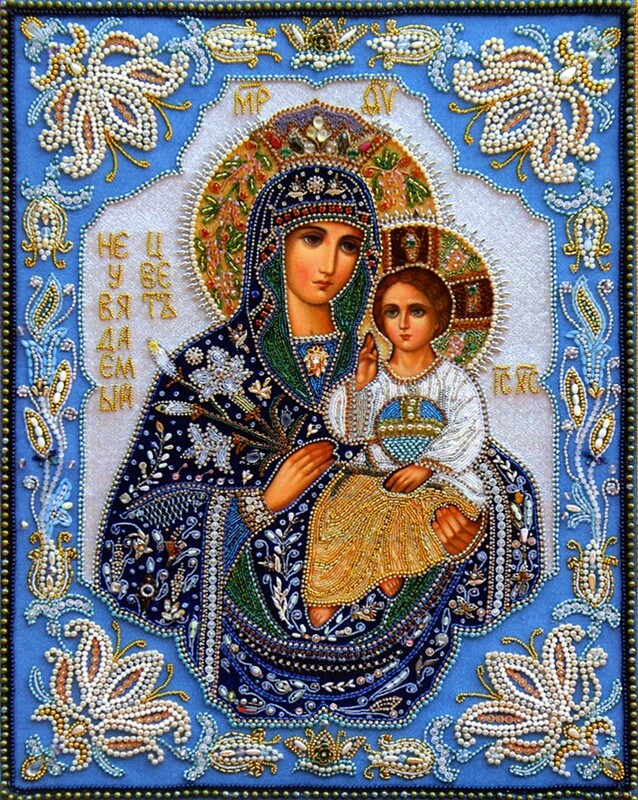 It's also worth remembering that there is a very long tradition of embroidered and beaded icons for use in vestments, banners, plashchanitsi/epitaphioi and the like. But usually they're not as overloaded as this icon. Ugh. One of the favorite compositions of devotees of the Prosopon School. It would be best if it were painted over with something that actually expresses proper Orthodox teaching. 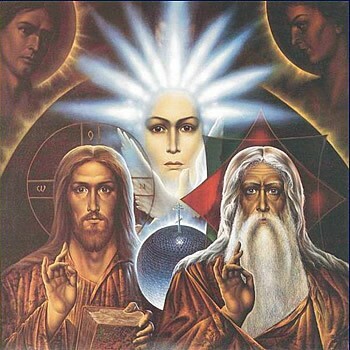 This is a very odd variant of the uncanonical New Testament Trinity icon, which I find very interesting. ^^ Indeed, it's interesting, I've never such type of "icon". I can't understand why the Holy Spirit is the most close to the cross, and the symbols of 4 evangelists are below not only the Son, but Father too. I would hope Holy Spirit is near me at my time of death. 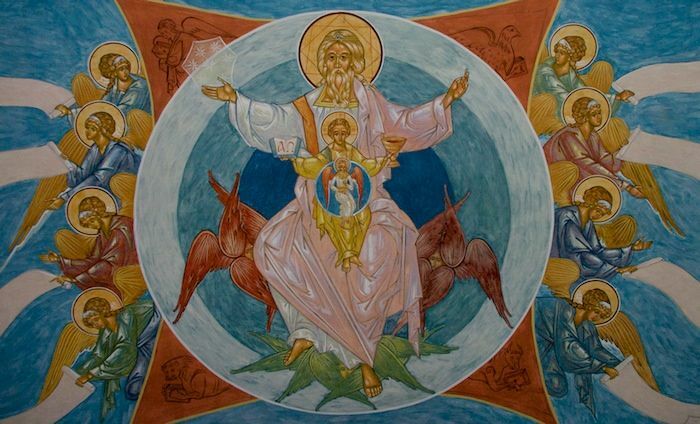 Is not everything, including the four evangelists under Him? and even seated upon them as they revealed Him to us, no? As to what's on the table...I thought it was a Glock! What's the second one supposed to be? It looks like the Mystical Supper but Christ has been replaced by His Mother and her betrothed. His IC XC 'identifier' is still there though. Also, why is it Chanukah? The candles are arranged in a candelabrum called a menorah (or sometimes called a chanukkiah) that holds nine candles: one for each night, plus a shammus (servant) at a different height. The one in the icon has 7 total. In the United States, candle holders with 7 candles are most commonly associated with Kwanzaa rather than Chanukah. (However, Kwanzaa candles are always colored; three red, three green and one black, which is not the case in this picture either). I actually really like the first one, even if it's uncanonical. The second one looses brownie point for having the Holy Spirit appear as a dove. 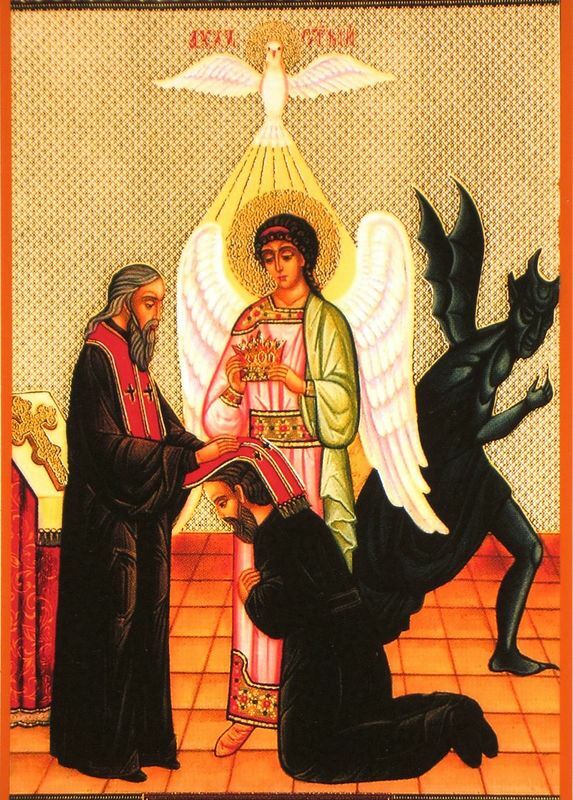 My understanding is that icons like this aren't suitable for veneration? 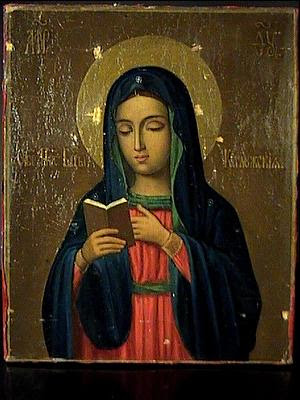 The Theotokos is depicted without her headcovering. Is that right? The lack of headcovering is just one of the serious flaws this image has which make it unsuitable for veneration. The way the Theotokos is holding her hands? 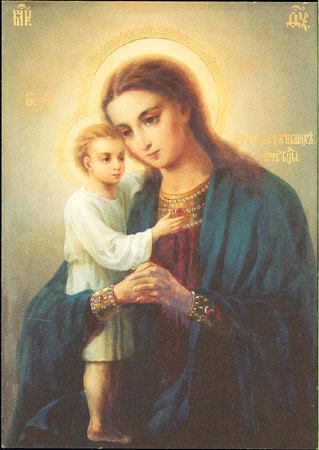 The lack of stars of ever-virginity on the shoulders and forehead of the Mother of God. Her ever-virginity is a dogmatic teaching and truth. The way she is holding her hands - in a composition like this, she should be pointing to Christ with one hand, showing Him to be the way to salvation. The lack of a cross made up of nine lines within Christ's halo. The overly sentimental, naturalistic painting style. Can you tell what the script is? Russian, Georgian....? 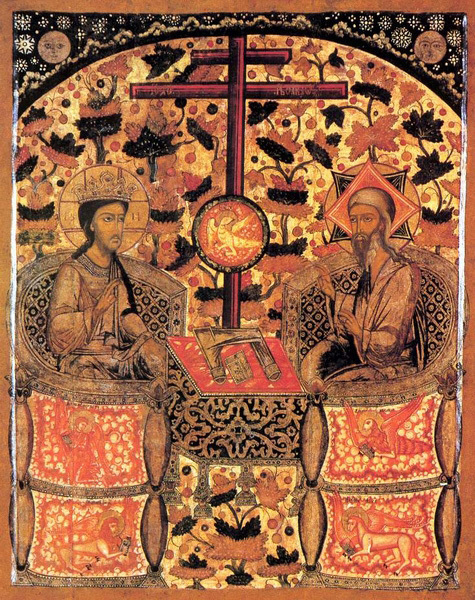 I think I haven't seen any icon with Russian inscription. Of course! Thank you, Dominika. I have to wonder if it was made by Eastern Catholics. Or simply an enjoyable painting. I gather it was the latter. The division saddens me, that something so beautiful and for which it stands would not be venerated. Might be a touch of a melancholy mood or a rebellion that others tell me what is Holy and not so. The last one wouldn't be bad if it didn't add the Lord Sabaoth figure.